Mesh is renowned for providing value for money PCs and so we expected the MESH Elite2 D820 ANS to deliver one or two pleasant surprises. It didn't disappoint, either. For starters, you get a very acceptable 250GB of hard drive space and instead of the usual 16x DVD writer, Mesh provides the latest 18x Sony model, with DVD-RAM support thrown in for good measure. The system delivers great picture quality on a 19-inch widescreen monitor. Better still, it comes with Vista Home Premium, that's a significant step above the Home Basic competition and a very good deal at this price point. There's also a decent Logitech keyboard and mouse, a bundled copy of Microsoft Works 8.5, and a one-year on site, then two-year return to base warranty. But wait, there's a problem. £500 really isn't enough money for a quality PC and so if a system excels in one area, it's likely to fall down in another. That's what happens here when it comes to graphics. The Elite2 D820 ANS comes with a limited Intel GMA setup, which returns sub-1000 scores in 3DMark 05. In other words, it's at the laptop level: a system capable of running 3D games in theory, but you'll never get decent performance out of it. 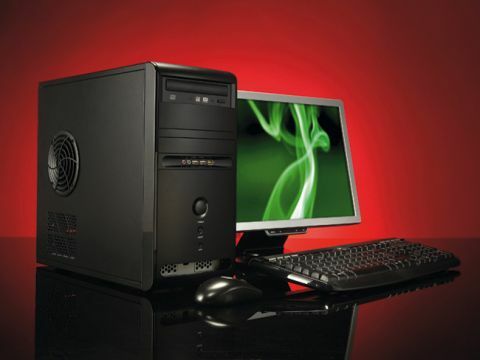 The choice of a Pentium D 820 is another mark against the PC, which makes it slower than the desktop competition. There are no speakers with the system, either, so you'll either have to use the tinny, low-power ones provided with the monitor or go out and buy a set of your own. Still, if you're looking for a workhorse PC, for home office work rather than family or gaming use, then you're unlikely to be concerned about these issues. In which case this is a likeable system that should definitely be high on your list of potential purchases.